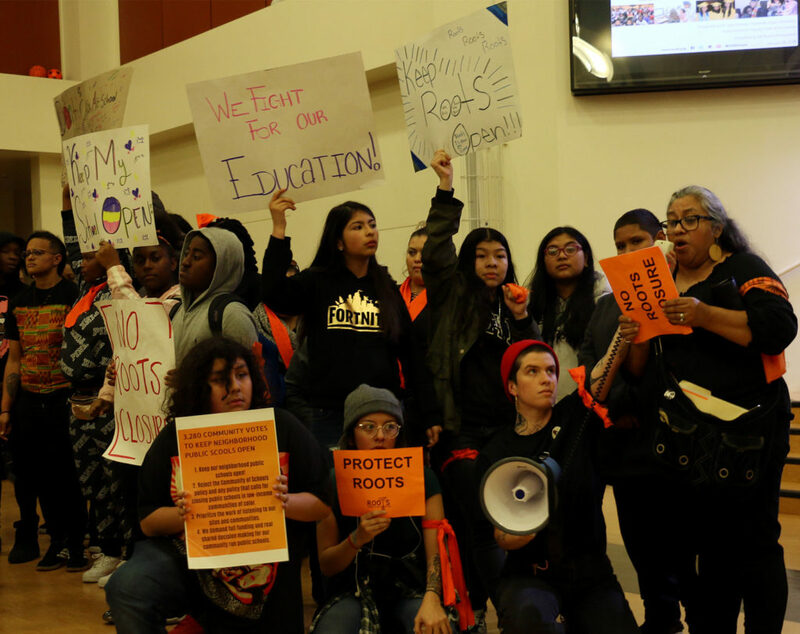 At a contentious meeting on Monday night, the Oakland Board of Education voted to close Roots International Academy, a middle school in East Oakland, at the end of the 2018-19 school year. After hearing from Roots students, teachers and parents who asked the board to not close their school, the board voted six to one in favor of closing it. The vote came at the end of an emotional and tense four-hour meeting. Over 100 people filled the room at the La Escuelita Education Center at 6:00 for the special evening meeting. All around the room, community members wore orange—headbands, shirts, sweaters, arm bands—to show their support for Roots. Scattered about were signs that read “Don’t close Roots” and “How can you close a school you never fully funded?” Supporters held a large banner stating “Let Roots grow” throughout the meeting. 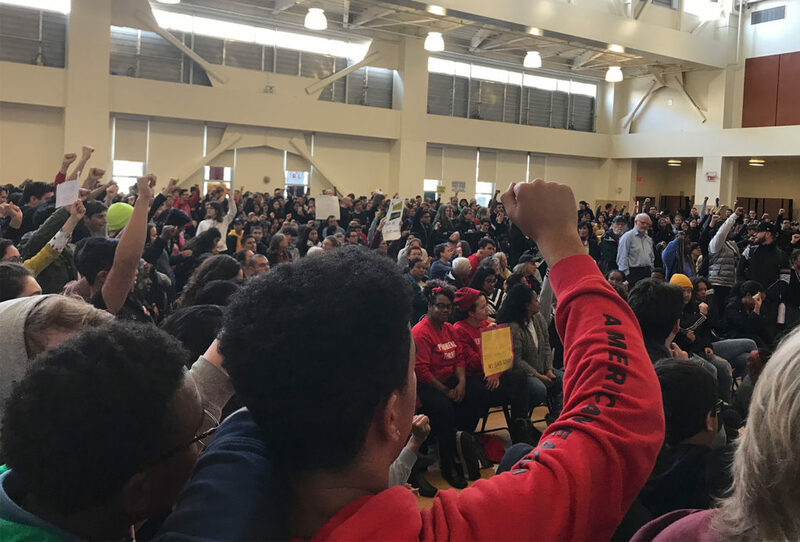 The meeting began with a presentation from Yvette Renteria, the Deputy Chief of Innovation for the Oakland Unified School District (OUSD), on how the school’s closure would affect current students and families there—each mention of the potential closure elicited boos and hisses from the audience. Renteria said that every family would receive one-on-one counseling about enrolling in a new school. The closure of Roots is part of the district’s larger “Citywide Plan” that aims to address under-enrollment at district-run schools. 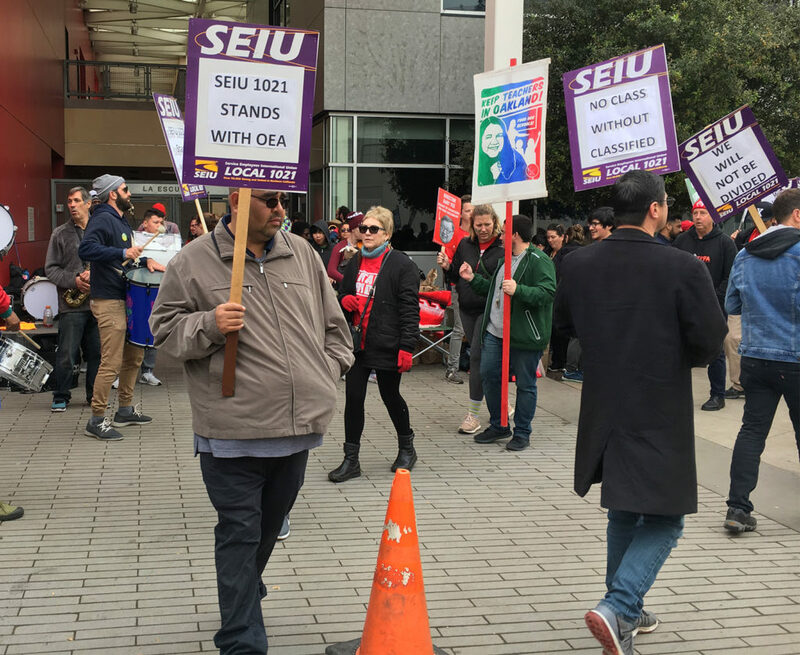 District staff say that the OUSD operates too many schools and with declining enrollment, which means that resources and funding are spread too thinly across campuses. Under-enrollment has also led the district to project a $30 million deficit for the 2019-20 school year. The school board is expected to vote on budget cuts that would address that deficit soon. At Monday’s meeting, Superintendent Kyla Johnson-Trammel said that in addition to making the budget cuts, the district needs to “right-size.” As part of the Citywide Plan, the Blueprint for Quality Schools, an initiative that aims to assess and improve school quality in the OUSD, calls for the closure, expansion, or merger of up to 24 schools across the district. The plan is already underway with several schools in what the district calls “Cohort 1” merging at the end of this year. 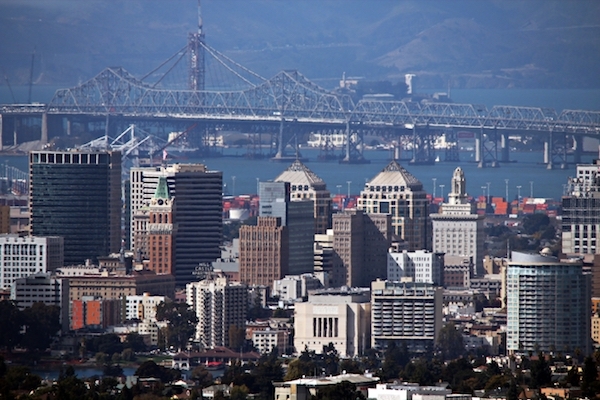 Alliance Academy and Elmhurst Community Prep, two middle schools that share a campus in East Oakland, are merging into Elmhurst Alliance for the 2019-20 school year. Futures Elementary School and Community United Elementary School, which serve the same neighborhood as Roots, are also merging into one school for the 2019-20 school year. Staff at the “Cohort 1” schools have been planning their mergers and using the current school year to transition. Roots primarily serves African American and Latino students from the surrounding neighborhood, who together make up 87 percent of the student body. Over 95 percent of Roots students receive free or reduced lunch, which means their family’s income is at or below the federal poverty level. At the beginning of the school year, Roots was slated to be part of “Cohort 2,” which means that the staff would have the 2019-20 school year to plan a merger with College Coliseum Prep Academy (CCPA), a middle and high school. The two schools already share a campus. According to an earlier presentation by district staff, Roots was selected for “Cohort 2” due to its low enrollment and students’ low scores on state tests. Across all grade levels, Roots had lower scores than the district average on the Smarter Balanced Assessment Consortium (SBAC) test, which is state-mandated, standardized, and based on Common Core standards, in both English language arts and math. Renteria also said that during this year’s enrollment process, there was historically low demand from parents to send their kids to Roots. But district staff proposed expediting the process and closing Roots at the end of this school year, forgoing a potential merger with CCPA, due to concerns about how under-enrollment would affect the school’s budget for 2019-20. Under this proposal, CCPA will start an expansion with the incoming sixth-grade class next year and move into Roots’ classrooms. Current sixth and seventh-grade students at Roots will receive priority in placement at schools of their choice, but CCPA is only projected to have two spots available in each grade. About 100 current Roots students will be unable to attend a middle school in their neighborhood next year. During the meeting on Monday night, Roots students shared their frustrations with the board during the public comment period. Students asked board members why they have to close the school now. Students asked how they could call Roots “low-quality” if they’d never been to a class there. And they asked the board members why they couldn’t give the school more resources and funds so that they could grow and improve. In addition to speaking about their frustrations with the closure process, Roots students and teachers told the board about the tight-knit community they have at the school and how the school has affected their lives. “I used to hate school, but this school actually made me want to go. And I was happy here every day,” said seventh-grader Octavio Mendoza. After all members of the Roots community spoke, public comment was opened up to the rest of the audience. At one point, an Oakland student who didn’t attend Roots, returned to the podium to make a second public comment. Board Vice President Jody London (District 1) cited the board policy of allowing each person only one comment, and the board turned off the microphone. A chorus of boos and “Let him talk!” rained down from the audience. Public comment resumed with a stricter enforcement of the one-minute time limit. A few minutes later, the Roots students, teachers, staff, and parents interrupted the meeting. Addy Rios, the parent of a seventh-grader at Roots, spoke through a megaphone. She called for all parents to keep their kids home from school on Friday in solidarity with Roots, and she warned the board that this would not be the end of their fight. A chant of “We are Oakland, keep Roots open!” broke out in the audience. On the stage, Board President Aimee Eng (District 2) called for a recess and the board members left the stage. The audience booed them as they left. Twenty minutes later, the board returned and the meeting resumed. Board members were given the opportunity to ask any final questions of district staff before their vote, and focused on asking what would happen to current sixth and seventh-grade students next year if Roots closed. Director James Harris (District 7) proposed an amendment that would give Roots students priority to enroll at CCPA. But, given the limited number of open spots at CCPA, it’s unclear if that prioritization would have any effect. Eng asked for assurances that district staff would do their best to keep current Roots students at a school in their neighborhood, that Roots teachers would be hired at other schools, and that any displaced students would receive support from the district as they transitioned to a new school. Renteria said the district would follow through on all those promises. At about 10:00—after many Roots students and teachers had already left because it was getting late on a school night—the board voted to close Roots. The two student directors on the board, Yoto Omosowho and Josue Chavez, voted against the proposal, along with Director Roseann Torres (District 5). The remaining board members—President Eng, Vice-President London, Director Harris, Director Gary Yee (District 4), Director Jumoke Hinton-Hodge (District 3), and Director Shanthi Gonzalez (District 6)—voted in favor. As the audience again booed the board, Eng adjourned the meeting. The remaining Roots students, teachers, staff and parents gathered and, through tears, embraced one another.